QRP is the "Q" signal meaning lower your power/should I lower my power? It has come to mean all low power operation, especially on HF. QRP operators have diverse interests -- CW, building, backpacking, mobile, contesting -- with the common thread ofdoing it with less than 5 watts. QRPp is sometimes used to refer to extreme QRP -- operating with less than one watt of power. QRPp is also called milliwatting. The QRP aspect of amateur radio is growing in interest level. 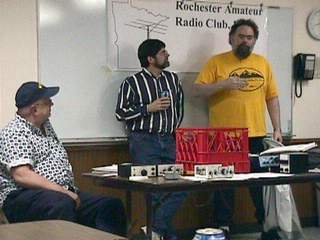 Tony, AAØSM, gave at presentation to RARC club members at the March, 2001, monthly meeting. 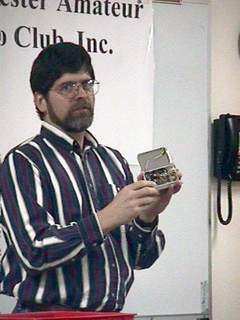 Tony, AAØSM, shows a 40 CW QRP transceiver at the March club meeting. Talking about QRP operation at the March meeting. Left to right: Dave W9SUL, Tony AAØSM, and Pat NØADQ. NorCal is the best place to start. They regularly hold contests and provide QRP kits. The site has tons of other QRP links. The QRP Amateur Radio Club International produces a great quarterly newsletter. They sponsor several contests and awards including the 1000 Miles Per Watt award. The Minnesota QRP Society is centered in the Twin Cities, but has members from across the state. They have a mailing list discussing meetings and events. The New Jersey QRP Club sponsors contest and building projects. Lots of information is available at their site. Most QRP activity centers around these frequencies.